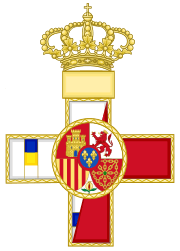 The Crosses of Military Merit (Spanish: Cruces del Mérito Militar) are Spain's military awards for gallantry or merit in war or peace. Awarded to members of the Spanish Armed Forces, Guardia Civil or civilians. 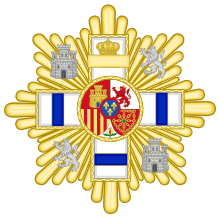 Established on 3 August 1864 by Queen Isabella II as the Order of Military Merit (Spanish: Orden del Mérito Militar), it has been amended many times (in 1918, 1926, 1931, 1938, 1942, 1976, 1995, 2003 and 2007). During the Spanish Civil War it was recognized by both sides of the conflict. Awarded originally in four classes, in 1995, in 1995 it lost the rank of an order of merit, and the classes were reduced to two and the number of categories extended to four. Cross - to other officers, non-commissioned ranks or equivalent civilian personnel. with White Decoration (con distintivo blanco) - for actions, deeds or distinguished service during of missions or ordinary or extraordinary service in the armed forces or in connection with defense of the country. Multiple awards of each class and each category to the same individual are possible. The decoration has the form of a Greek cross with the arms enameled red in the Red Decoration category and white in the remaining categories. The Blue Decoration and Yellow Decoration badges have additional narrow bars in blue or yellow across the lower and lateral arms. The upper arm is surmounted by a Spanish royal crown and has a tablet to engrave the date of bestowal. The round central shield of the obverse bears the coat of arms of Castile, León, Aragon, Navarre and Granada (until 2003 only alternate coats of arms of Castile and León); in the middle there is a blue oval shield (escutcheon) of the House of Bourbon-Anjou. On the reverse there are letters "MM" (Mérito Militar) on red background. The cross is worn on a ribbon on the left side of chest. Each subsequent award is denoted by a bar with the date of bestowal on the ribbon. The Grand Cross has the same form as the cross described above but is worn on a sash over the right shoulder. 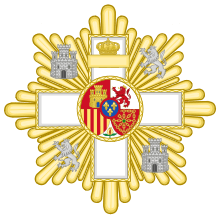 The star added to the class of Grand Cross is gilt, eight-pointed, with the cross superimposed on it; currently between the arms of the cross there are alternate towers (Castile) and lions (León). Juan L. Calvó Pascual, Cruces y medallas 1807/1987, Monte Cotiño 1987. Real Decreto 1040/2003 of 1 August 2003 about military decorations. Real Decreto 970/2007 of 13 July 2007 amending the Real Decreto 1040/2003. ↑ Royal Decree 1040/2003, 1 August, Military Rewards Regulations. BOE (03/09/05) (Spanish). Accessed December 25, 2012. ↑ Defence Ministry Order /3594/2003, of December 10, by that approved rules for ordinary processing and concession of the Crosses of the Military, Naval and Aeronautical Merit, with white badge, and of the honorific mentions, the delegation of competitions in this matter, and use of representative decorations of rewards.. BOE (03/12/23). (Spanish) Accessed December 25, 2012. Cruz del Merito Militar by Antonio Prieto Barrio (in Spanish). Spain: Order of Military Merit by Megan Robertson.